Over 50 million mobile apps are downloaded daily. One in four is abandoned within 24 hours. In other words, creating a successful app is incredibly difficult. Pressure from internal and external sources to increase downloads, engagement, and create new and/or enhance existing revenue streams is constant. App owners must differentiate products while making experiences more fluid to ensure they become essential to the lifestyles of their users. -Data-driven context: The anatomy of a “location” data point and how to put it to work in your experience. -Categorizing behavior: Learn how to categorize user actions and what to do with the results. -Building App modes: putting the power of place to work in your app to anticipate user needs, monetize your app, and differentiate your app experience. -Case studies to demonstrate what leading apps are doing and current best practices. 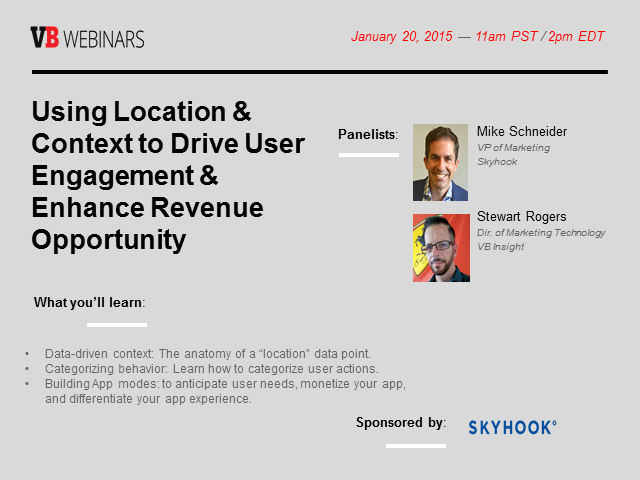 Join us to get actionable takeaways, gain insight, and to pose questions to the leaders in location about our experience in how to make your app become a vital part of your users’ everyday lives.